The DNA Damage ELISA (enzyme-linked immunosorbent assay) is a fast and sensitive immunoassay providing results in less than 2.5 hours. 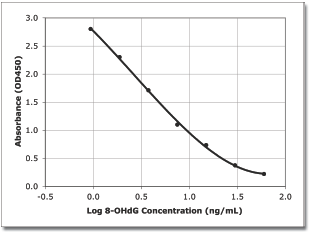 Quantitation of 8- hydroxy-2’-deoxyguanosine (8-OHdG) in urine, serum, and saliva samples is performed in a convenient 96-well plate format using a colorimetric substrate. 8-OHdG is a frequently-used critical biomarker of oxidative stress and carcinogenesis. Figure 1: The standard curve has a range of 0.94 – 60 ng/mL. Sensitive and versatile method for measuring single- and double-strand DNA breaks in individual cells. Exposure of cells to oxidative and environmental stresses frequently results in the breakdown or oxidation of genomic DNA. Assays to evaluate the integrity of genomic DNA, or to assess the presence of oxidized DNA are frequently used as a means of verifying the onset of apoptosis or DNA damage. The Assay Designs COMET SCGE Assay measures DNA damage by fluorescently detecting the integrity of DNA liberated from cells embedded in low melting point agarose. Upon electrophoresis, fragmented DNA produces a characteristic “comet” shaped tail as small DNA fragments migrate in the gel more rapidly than in-tact genomic DNA. The COMET SCGE Assay is a fast and simple electrophoresis method to detect and quantitate DNA fragmentation in cells associated with DNA damage and apoptosis. A unique nucleic acid stain provides improved sensitivity for DNA visualization compared to ethidium bromide. Highly permeable fluorescent dyes for DNA content analysis in live or fixed cells. Figure 1. 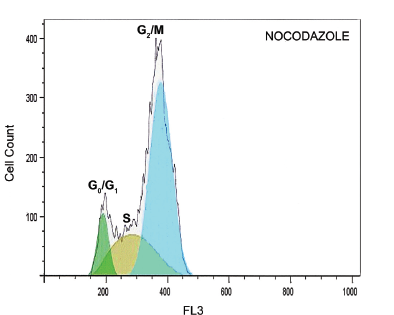 G2/M accumulation of Nocodazole-treated cells using Nuclear-ID dye in live cells.